Radiotherapy tattoos or skin markings help make sure external radiotherapy treatment is accurate. 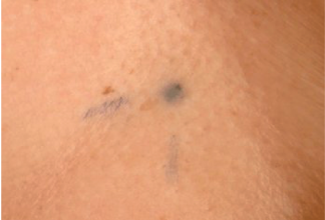 During your radiotherapy planning session, your radiographer (sometimes called a radiotherapist) might make between 1 to 5 permanent pin point tattoo marks on your skin. For some types of radiotherapy, for example, electron treatments, you won't have tattoo marks. Your radiographer uses the tattoos to line up the radiotherapy machine for each treatment. This makes sure that they treat exactly the same area each time. Your radiographer might also draw marks around the tattoos with permanent ink pen. This highlights the tattoos in a dark room and makes them look like small crosses. Don't try to wash them off. The pen marks will start to rub off in time. They can rub off on your clothes or when you wash. If that happens, tell your radiographer, they can redraw them the next time you have treatment. It can help to wear older clothes next to your skin during your treatment. Or you can ask your radiographer after each treatment to remove them with a wipe.